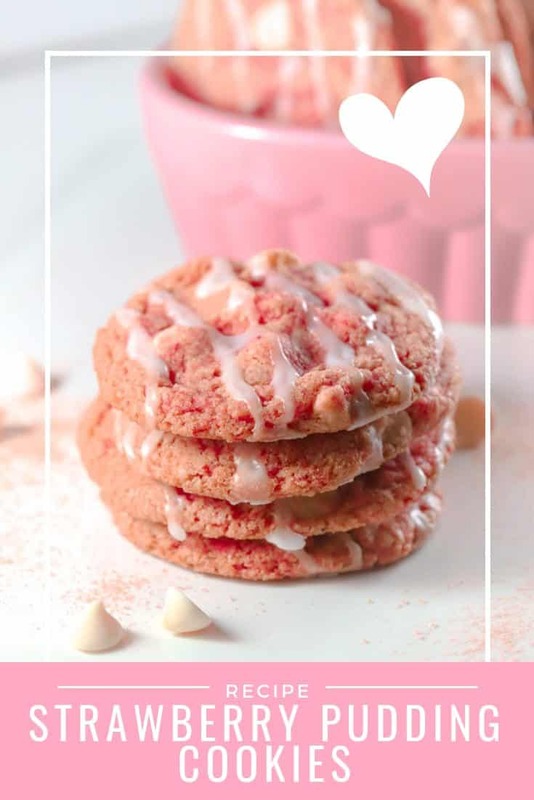 Strawberry pudding cookies are perfect for your Valentines celebrations! These pink cookies are festive and sweet and make a festive homemade gift. White chocolate chips look like little hearts in this Valentine’s Day dessert. 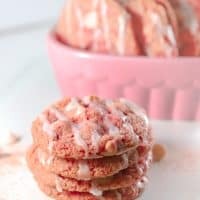 Pink cookies or even pink and white cookies were my goal in baking this cookie recipe. I love this gingerbread recipe that uses instant butterscotch pudding mix in the ingredient list so I repeated that step and added a few tablespoons of strawberry Jell-o mix to achieve that holiday hue. 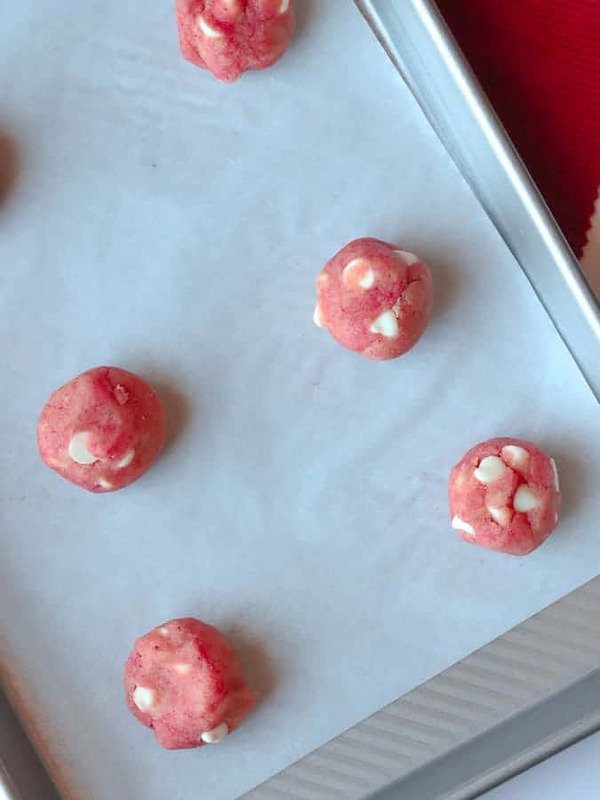 Adding red, pink, and white sprinkles would be another fun way to dress these cookies up for a Valentine’s Day treat. What ingredients are in Strawberry Pudding Cookies? How do you make pink cookies? The instant Jell-O mix provides all the color in these cookies. I experimented with crushed, freeze dried strawberries but the pink hue was lost during baking. Pink or red food coloring might also be a good idea if you are trying to bake pink cookies. Bake these cookies following the usual technique for cookie baking: blend the butter and sugars (which here includes the Jell-o mixes), add the egg, then the dry ingredients too. Fold in the chips. Place rounds of cookie dough on parchment lined baking trays and bake until done. Today’s cookies are a special contribution to the 2019 Good Cookie Food Blogger Event where bloggers come together to support the nonprofit organization, Cookies for Kids’ Cancer. This is the third year of the Valentine’s event and my first time participating. I am so pleased to be part of this special cause. Let’s make a difference in the fight against pediatric cancer! Did you know that cancer is the #1 cause of death of children by disease in the U.S.? There are 40,000 U.S. children actively battling cancer right now. With less than 4% of the National Cancer Institute’s budget going to all childhood cancer combined, we all need to do our own small part in fighting cancer. In addition to pink cookies, there are other fun ways to make red and pink treats for Valentine’s Day. Try these quick macerated strawberries to top vanilla ice cream or crepes. Bake with red with these colorful stained glass cookie hearts— the inside layer is melted candy and the method couldn’t be any easier. Another cookie I love making for Valentine’s Day is a homemade fortune cookie. Add your own handwritten fortunes for a heartfelt touch. 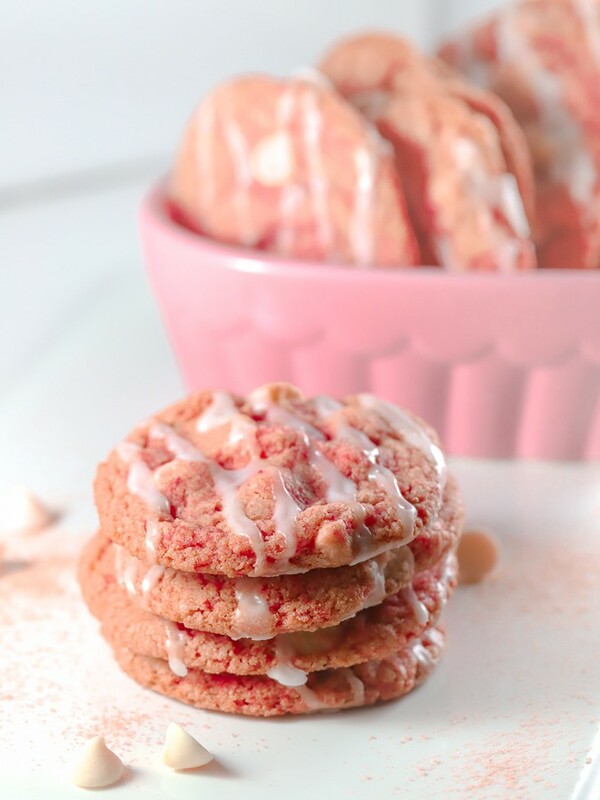 Strawberry pudding cookies are perfect for your Valentines celebrations! These pink cookies are festive and sweet and make a festive homemade gift. White chocolate chips look like little hearts in this Valentine's Day dessert. Beat the butter with the sugar, vanilla pudding mix and the strawberry Jell-O mix. Add the egg and blend until well combined. Add the flour (gluten free or traditional) and the baking soda. Form small balls of dough and place on the parchment lined baking tray. Note: Make these gluten free by using a 1 to 1 gluten free flour substitute. The cookies pictured here were made with Bella Gluten Free Cup to Cup Substitution All Purpose Baking Mix. *If you are making this recipe gluten free please double check that your white chocolate chips (and all other ingredients) are all gluten free too. Here are more gluten free cookie recipes you’ll enjoy baking! Hi Holly, You are wonderful for creating and sharing this lovely recipe for such a worthy cause! Your Mediavine swag is on the way and should be to you soon. It’s a small token of our appreciation for your time and efforts to wipe out pediatric cancer. Hi Susannah, gosh that is kind of you! I participated to help support this cause and it was my pleasure to do so. As much as I love receiving treats in the mail, I wonder if there might be an option next year to decline the swag and instead have an extra $$ donated to the nonprofit. It’s all about the kids! Thanks so much for your comment. I really appreciate it and am grateful for Mediavine’s support! Wow, what a beautiful recipe! From the bottom of my heart, thank you so much for participating in our V-Day event and driving awareness to C4KC’s mission!